There's a Mike Eddie in every parish in every county in Ireland. You know the breed yourself. 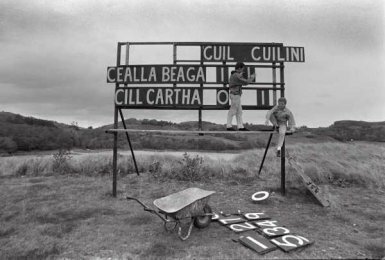 A good country farmer; estate car full of bailing twine, posters from the last local elections, fertiliser bags, balls, flags, hurls, jerseys, kitbags and - most importantly – the entire U-12 panel. His life was dedicated to the GAA, to the parish and of course to his family, twelve children in all. He was the county board delegate, the fixtures secretary, team selector, gateman, club historian, groundsman, dispenser of wisdom and, of late, monthly club draw organiser extraordinaire. His love of the GAA began in the Forties when he first lined out at underage level for the club. He went on to win two county senior championships in the 50's, the win in 1959 being the last time the parish scaled such dizzy heights. Despite all of this, the highlight of his playing career was in 1948 when he was selected for the county minor team for a Connacht Championship first round game against Galway. Many's the time he regaled the regulars in the local with tales of this narrow defeat and the common thread through all of his stories was the obvious pride which sparkled in his eye when he talked of this, his only ever appearance for his county. When emigration led to the disbanding of the club in the early 60's, it was Mike Eddie who kept the flame of the Gael alive in the area, ensuring that promising youngsters were catered for with the neighbouring clubs and in the mid-70's it was he who called the meeting which led to the re-forming of a club in the parish. From being Chairman of the club (and on occasion secretary, treasurer and even PRO) he graduated to county board level and eventually became chairman of Bord na nÓg. It was in this capacity that he was perhaps at his happiest, travelling the length and breadth of the county to parish leagues, divisional finals, county underage games and county finals. He knew every youngster in the county, not only by form but also by name. He couldn't sing and he couldn't dance, but when the call came for entries from the club to Scór he set about ensuring that every man, woman or child with even the slightest intimation of stage suitability was conscripted for the good of the club. Many's the poor reveller who sang an old ballad while tanked up on Arthur's black fuel after hours in the local on a Saturday night and found himself press ganged into the ballad group for that year's Scór effort, all on the indisputable insistence of Mike Eddie himself. Indeed, he took to the stage himself on a plethora of occasions, an ever present on the parish Tráth na gCeist team for over twenty years. All-Ireland's were his specialist subject and he hadn't missed either a football or hurling final since the mid-50's. One of my own first All-Ireland's was as a young gosoon in the back of his Datsun estate, reliving a ritual that had evolved over forty odd years; mass in Maynooth, park at the Mater, breakfast in the Dergvale, pints and a feed on the way home in Mullingar. In later years, a word of praise from Mike Eddie after a league or championship game was worth ten from anyone else. Victory or defeat was greeted with the same seemingly nonchalant indifference. But deep down we all knew he felt the emptiness of defeat and the self-satisfaction of victory as keenly as any of the players. He was as much a part of the club and the parish as the leaves on the trees or the water in the river. Always there, we took him for granted. Thus it was a sombre parish which turned out to a man to say a last farewell to Mike Eddie. His passing was sudden, but its impact will linger. Only the week previously he had told me in his own amicable way as we supped a pleasant pint, that there was no such thing as bad porter, only good porter or better. Over a hundred black-and-amber clad current and former players lined the avenue from the road to the church; the U-12's through to his comrades from the 50's. All stood silently in recognition of his contribution to our parish, to the county and to the GAA in general. His ten sons took it in turn to bear his coffin, in grief at the loss of a father. Deep down we'd all lost a father. Yes, there's a Mike Eddie in every parish in Ireland, but in ours, the search must start again.